If you’ve been a Eat Better America email subscriber as of 7/24, click here to visit the Pillsbury site and you’ll be able to request a Free Sample Of Apple Cinnamon Chex Cereal. Allow 6-8 weeks for delivery. why am i not able to recieve a free sample. i am signed up and still not able to recieve it… why?????? Sounds good, I know my son loves Chex. I would LOVE to try this! I have been eating Chex for YEARS since I’m 57 years old! Please send some my way! 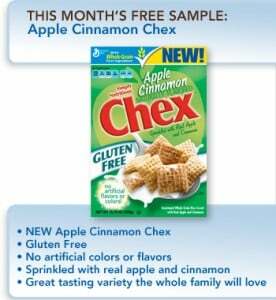 Would like to try Apple Cinnamon Chex. I want to know y im not eligible???? why am I not eligible to participate??? Says they are out of samples. Ineligible because I wasn’t a member YESTERDAY. Grrr.